Sketches / 14 – grading framework. I realized that when it comes to sixth and seventh grade work, I care a great deal about neatness and form on the one hand, and content on the other. I made this chart the other day to consider how there are intersections between them, and how I should consider grading the two kinds of work. I’m not sure that I’m prepared to just start USING this as the method by how I grade student papers, but this is still a potentially interesting idea. 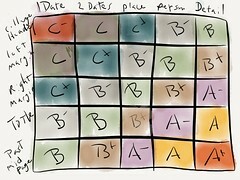 Does anyone else use a similar rubric? Form and content are the big issues I wrestle with when grading. I made this chart to try to help myself understand what sort of things I cared about when grading history papers. I’m not sure I’m prepared to adopt this as an official document yet, but I’m planning on considering it over the summer.